Author Barry Robin leads a busy creative life: he is the creator of the long running Manhattan Neighborhood Network TV show Barry Robin’s Dance and Music Meditations, a show that has featured Improvisational Music, Dance and Comedy in various live locations on the streets of Manhattan, Brazil and many other places, he has two music albums, has also written a movie screen play, many plays, comic books, and children’s stories. His dream is to produce books that will help people to realize their own dreams as a counselor, teacher, family member and good friend. 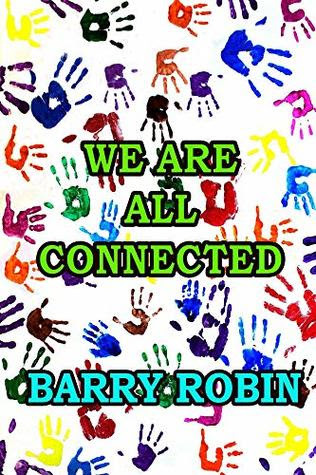 As the synopsis offers, ‘We Are All Connected is a multi-genre book that explores, in a fun way, how we are all connected to each other. The reader is taken on a unique spiritual journey where Romance, Comedy, Science Fiction, Poetry, Theater and Self-Help are all used to help the reader find his/her connection to everyone and everything that exists. By the end of the book the reader will have a greater feeling of connectedness, love and joy. And the reader will have had a lot of fun!’ A very fine summary. Barry’s chapters suggest the content The Roach, The DNA Ancestry Test, Strange Connections Parts One thru Three, You Mean I Am Connected To All This?, Love Is The Mystery That Binds Us, I See God In Everything, and Ripples Test Our Connections. This little book is a joy – and it needs spreading about. Perfect gift for friends and loved ones.